The latest units that I have finished are these two units of wolf riders. Each unit consists of two bases. Kings of War is our fantasy game of choice right now, as determined by theottovonbismark and MT after they played some experimental games using a number of systems. In KoW the goblins and orcs each have a separate army list. Both armies feature units called “Sniffs” which are described as bow using lesser orcs. 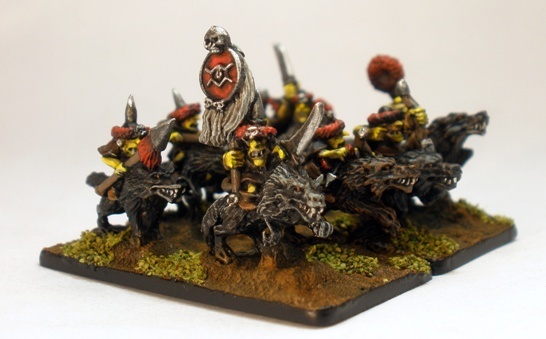 The sniffs in the orc list are infiltrating scout troops and the sniffs in the goblin list are these guys, bow armed wolf (or “fleabag” in KoW parlance) cavalry. With scale creep and stylistic differences the line between an orc and a goblin in 28mm can sometimes be a bit blurry. This is further pronounced in 10mm I have found, with some manufacturers goblins being larger than other manufacturers orcs for example. Although I am fine with the notion of orcs and goblins being quite variable in appearance (like dogs), it is usually important to be able to easily distinguish which troop type a tabletop model represents. It is important that this is apparent not only to me, but very obvious to my opponent too. So I decided to paint my sniff units with yellow skin tones to distinguish them from the orcs and goblins. For reasons that I am unsure of I associate yellow and orange with hobgoblins. It could because of the old GW “Hobgoblin Orange” paint, but I think that its more that that. Seeing as sniffs straddle the line between orcs and goblins I figured that yellow flesh might work. 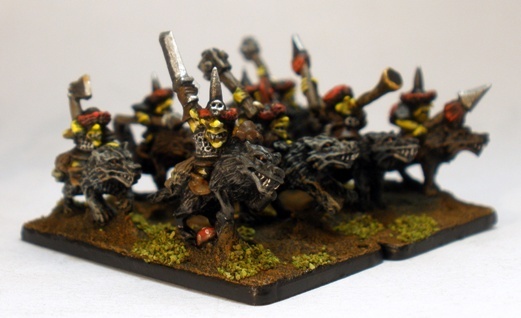 The models themselves are GW Warmaster goblin wolf riders. Whatever issues people might have with GW, their 10mm fantasy figures are better than any other manufacturers that I have come across so far although predictably they are eye-wateringly expensive. You, sir, are a one man painting machine. You’re churning these out like no tomorrow! Yeah, output is good at the moment, although I think I can feel the early stages of burnout. As a result I am painting up some very different stuff now in an effort to stave it off. There are still a couple more 10mm photos to go up yet though. Excelsior! You nailed it Mattias, the connection is definitely because of Hobgoblin. My first real taste of regular Marvel reading was Spidey circa Secret Wars. Hobgoblin was a regular adversary in that era, something of an arch nemesis for a while. A defining bad guy while I was at an impressionable age. Considering that and the fact that I played a helluva lot of Heroclix for a few years, I should have made that connection myself. Duh. So we come from the same background then… =) I grew up on late 70s, early 80s Spidey and Hulk, with a sprinkling of Daredevil, Avengers and X-Men. These were random injections, and much like you I didn’t get regular until around Secret Wars. Now I have a more or less complete run of Swedish Spider-man from 1974 and forward. I miss about 20 issues from the late 90s and early 2000s. Secret Wars, Hobgoblin, Jean DeWolfe, Sin Eater and all that stuff was during my most Marvel-passionate years. Soon after that, Vertigo comics got published in a monthly anthology in Swedish collecting Shade, Sandman, Swampthing, Hellblazer and Doom Patrol. With that I lost interest in the regular supers genre. I actually funded my buying of Blood Bowl 2nd edition by selling off a LOT of old comics to the shop where I bought my sundry geekery. The Jean DeWolfe/Sin Eater storyline was a watershed moment for me. It was when my 11 year old (or so) self realised that US superhero comics could be a more “grown up” (whatever that means) than I had thought possible up until then. 2000AD had already done subversive work on me in that regard of course, but that was the first time that I had seen Spidey out of his comfort zone to that extent.